In a blender combine all ingredients of the sauce and pulse until frothy. 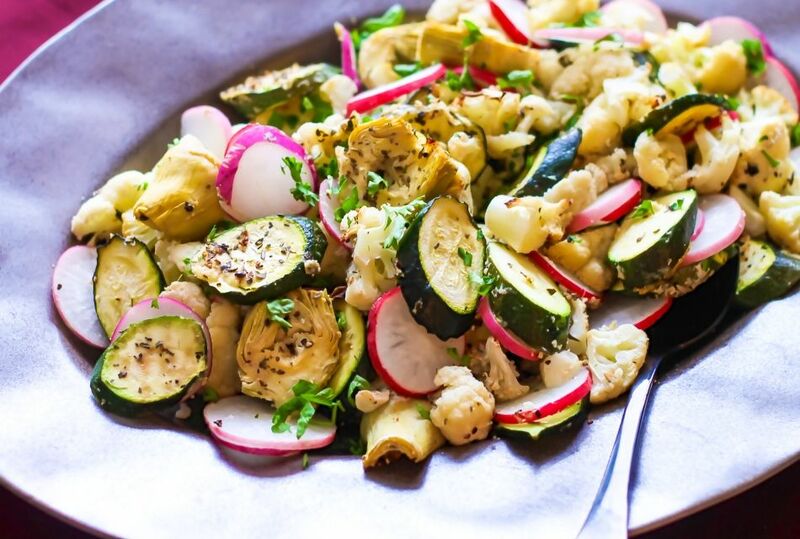 Cut cauliflower, zucchini and artichokes into pieces, then arrange them in a single layer in the pan, spray with Fry Light olive oil and sprinkle some herbs, salt and black pepper then mix. Roast the vegetables for 25-30 minutes, or until the cauliflower and zucchini are slightly crispy. In the meantime, slice the radishes and chop the parsley, then transfer to a large bowl. When the vegetables are cooked through, stir and combine them with the radishes, salt, and pepper. This salad can be served warm or cold to taste.